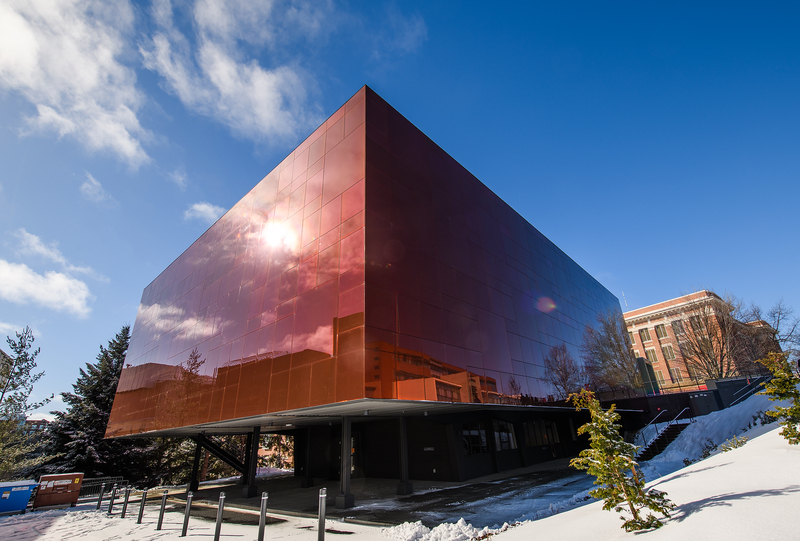 At the center of the Washington State University campus is a massive crimson glass cube perfectly mirroring its surroundings. Its mood seems to change, depending on the light of the sun or moon. It can cast a rose-colored hue over the people passing by, but what’s inside can shape their minds. The new Jordan Schnitzer Museum of Art WSU is a showpiece for the visual arts. For months people have watched the museum rise on campus. Beginning Friday, when it opens to the public, they’ll be able to see within. “We couldn’t put this art mousetrap in a better place on campus,” said Jordan Schnitzer, the Portland philanthropist who donated $5 million to the project and helped choose its location across from Martin Stadium and the Compton Union Building. While it exposes thousands at WSU to local, national and international art, faculty and staff should not rest until reaching out to every child and adult within a 100-mile radius, Schnitzer said in a phone interview Tuesday. “Historically museums have been seen as something for someone else. I want to break those walls down. This museum is for everyone,” Schnitzer said. The new museum is nearly double the size of the previous museum, with an additional 10,000 square feet of exhibition space divided into six galleries. The bulk of its $15 million price tag paid for its reflective red glass exterior, said Debby Stinson, the museum’s marketing and PR manager, who gave Inland 360 a tour before Friday’s opening April 6. “It’s the only one of its kind and color in the world, yet,” Stinson said. Paneled with layered glass on three sides, the building’s facade is extremely flat, creating a seamless reflection versus a funhouse mirror effect, she said. Red is one of the most difficult colors to fire in a kiln, Stinson noted. Some 25 to 30 panels were returned because the color, WSU’s signature crimson, didn’t exactly match. Elements of the building’s design elevate the art it houses to an otherworldly realm. One enters through towering doors inset with black wood. The wood came from a fir tree that met its natural end on campus, said Stinson. It was blackened using an ancient Japanese technique called shou sugi ban, which preserves wood by charring it with fire. Galleries are open rooms with spare detail to showcase the works they contain. For Gallery One, the museum commissioned Seattle-based sound sculptor Trimpin to create a permanent, major new work. In “Ambiente432” motion-sensitive, horn-shaped speakers hang from the ceiling and respond to movement by emitting tones tuned to 432 hertz, said to be a healing frequency for the human body. “I can’t wait until the grand opening when we have a crowd in here,” Stinson said. 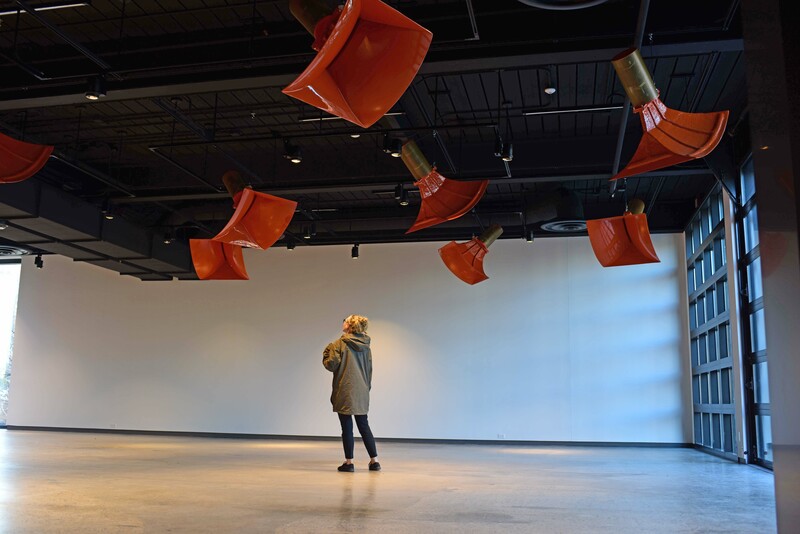 The sound sculpture “Ambiente432,” by Trimpin, is a permanent installation in the new musuem. With Schnitzer as its patron the museum has access to his vast art collection. He’s the largest collector of post-World War II American masters, which includes Andy Warhol and Roy Lichtenstein, he said. The WSU museum is the second in the country bearing his name. The other is at University of Oregon, Eugene. Another is in the works at Portland State University in downtown Portland. He’s inspired to share art with everyone because it inspires creative, out-of-the-box thinking and because artists chronicle our times, force us to deal with our issues and give people hope. “If your child grows up with a passion for the arts, it’s a gift that will go on the rest of their lives and help them in times of trouble,” he said. Mobile phones and social media spewing a constant barrage of opinion and information make the new museum even more relevant, he said. will speak at the ceremony.